The Yankees opened up their West Coast trip in disappointing fashion, dropping two out of three to the Oakland A’s. And that 1-2 record doesn’t come close to capturing just how frustrating the series was. With their Wild Card home-field advantage lead now sitting at 3.5 games, they’ll head up the coast to face the sinking Mariners. Domingo German was excellent in the first game, tossing 7 innings and allowing just two hits and two runs (one earned), while striking out 9. Clint Frazier – who turned 24 yesterday – started all three games of the series. He went 4-for-11 with a double and three runs scored. Bringing this up makes me both happy and sad. Aaron Judge, Miguel Andujar, and Giancarlo Stanton were a triple-headed monster in the series, going a combined 12-for-36 with two doubles, five home runs, and 11 RBI. The Yankees hit eight home runs overall in the series, with Andujar (2), Stanton (2), Aaron Hicks, Gleyber Torres, Gary Sanchez, and Judge chipping in. Juan Nicasio (knee surgery), David Phelps (Tommy John surgery), and Sam Tuivailala (Achilles tendon surgery) are all out for the year. Marco Gonzalez is currently on the DL with a neck injury, and it’s questionable whether he’ll be back in time for this series. The Mariners are 78-62 with a -47 run differential, and are currently 5.5 GB in the Wild Card race. That -47 run differential is by far the worst among teams with a .500 or better record (the Rockies are next-worst at -8), and their Pythagorean record is 65-75 – so they may’ve overachieved a bit on the season. Regression to the mean is in full-swing, though, as the Mariners have went 32-36 since they landed in the Bronx back in June. 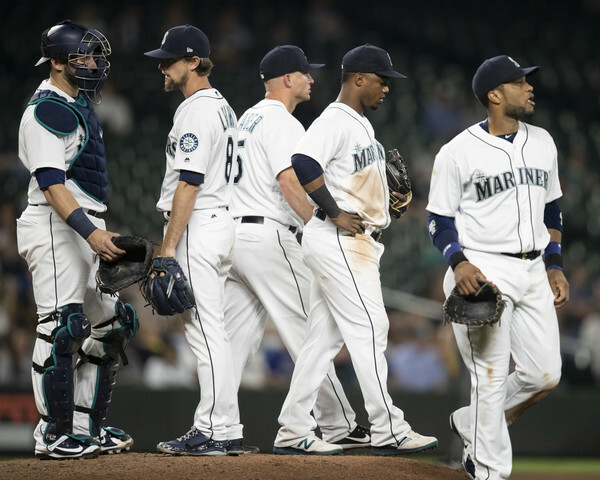 There isn’t one clear-cut reason for the Mariners backslide. Rather, it’s a combination of injuries, poor performance (and poorly timed poor performances), and the simple fact that they were playing above their talent level for a time. 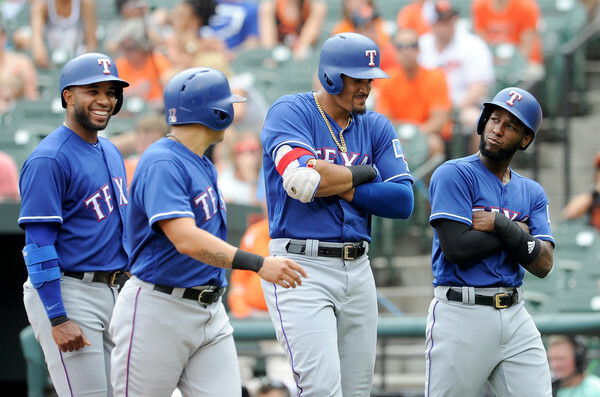 The fact that they’ve literally descended into clubhouse chaos probably doesn’t help, either. 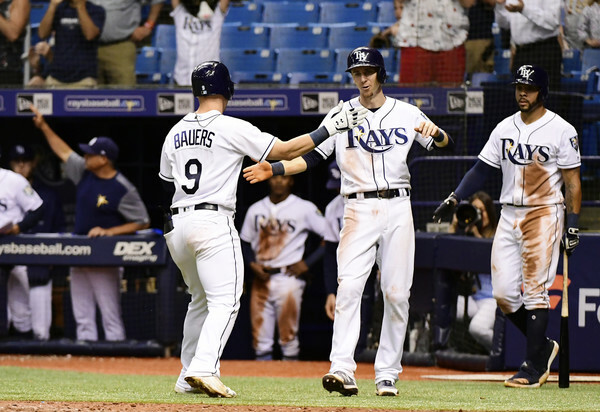 Ben Gamel (110 OPS+) and Cameron Maybin (86 OPS+) will probably see some time in the outfield; David Freitas (66 OPS+) is the back-up catcher. Paxton started against the Yankees back on June 21, and didn’t fare too well, pitching to the following line – 5.0 IP, 7 H, 4 R, 3 BB, 9 K. He has had two subsequent stints on the DL, the first coming in July due to back soreness, and the second in August, which was the result of being hit with a line-drive in his left arm. He’s otherwise been good, putting up a 3.74 ERA (107 ERA+) and 11.6 K/9 in 144.1 IP. Hernandez was sent to the bullpen a month ago, following a 6 IP, 11 R effort on August 7. That stint lasted exactly one appearance, as he relieved Paxton following the aforementioned comebacker, tossed 5.2 solid IP, and returned to the rotation the following week. Things haven’t gotten much better for Hernandez, though, as he still has a career-worst 5.55 ERA (72 ERA+) in 147.2 IP. Ramirez has been an up-and-down guy for the last several years, and he has done well in that role. He’s been in the rotation since mid-August due to injuries (first to Paxton, then to Gonzalez), and he’s performed admirably through five starts (24.1 IP, 24 H, 6 BB, 19 K, 3.70 ERA). 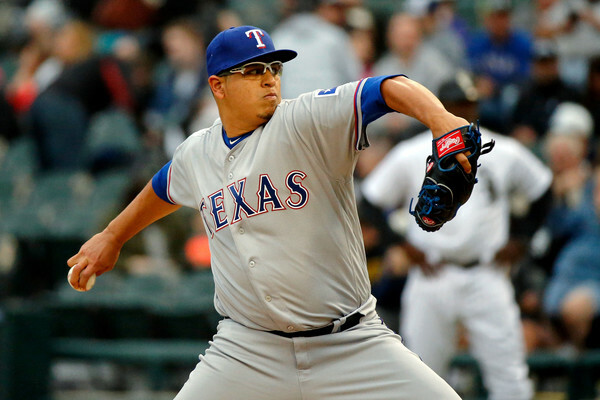 There’s a non-zero chance that Gonzalez will be activated in time for this start, but, as of now, it’s Ramirez’s turn. The 28-year-old is a three or five pitch guy, depending on how you look at it. He throws three fastballs (a low-90s four-seamer, a low-90s sinker, and a high-80s cutter), a low-80s slider, and a low-80s change-up. Edwin Diaz is in the midst of a ridiculous season. He currently boasts a 1.87 ERA (215 ERA+), 1.34 FIP, 15.6 K/9, and 2.1 BB/9, and he’s 53-for-57 in save opportunities. 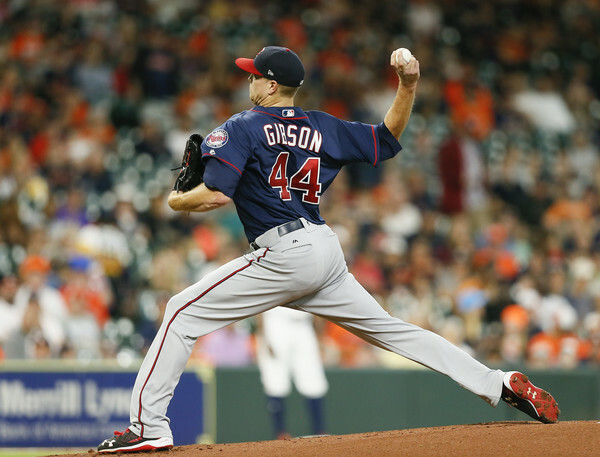 He leads all relievers in WAR, and he’s second in WPA (behind the A’s Blake Treinen) … and he’s still just 24. He’s a legitimate stud. Chasen Bradford (3.33 ERA in 48.2 IP), James Pazos (3.02 ERA in 41.2 IP), and Alex Colome (3.05 ERA with the Mariners) are the primary high-leverage options behind Diaz, and they’ve all been good thus far. Things are a bit dicey after that, though. It’s always a pleasure to see Robinson Cano on the field, even with his PED-related fall from grace. 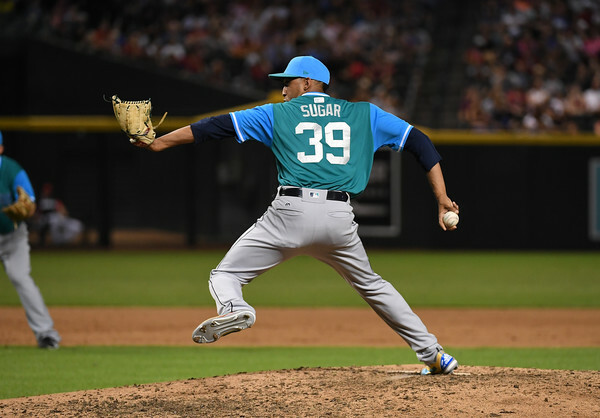 And Edwin Diaz has a very outside shot at matching Francisco Rodriguez’s single-season saves record of 62. The Yankees are in the midst of a five-series, sixteen-game stretch against well below .500 teams, and it could not have come at a better time. They’ve been banged-up for quite some time, and Didi Gregorius joined the walking wounded over the weekend. Wins and losses should never be taken for granted, but if there was ever a time for players to get a little bit of extra rest, it’d be these two-plus weeks. Luis Severino was brilliant in the first game, throwing six scoreless innings and allowing just one hit and one walk, while striking out 8. He picked up fourteen whiffs on 86 pitches, as well. Every Yankees starter reached base at least once in that game, and all but Ronald Torreyes reached at least twice. The now-injured trifecta of Aaron Judge, Didi Gregorius, and Gary Sanchez went a combined 7-for-12 with 6 runs, 3 home runs, 8 RBI, and 3 BB. Miguel Andujar was the Yankees offense in the loss. He went 2-for-4 with a double and a home run (he was 2-for-4 with 2 doubles in the first game); the rest of the offense went 2-for-26, with both hits being singles. Kyle Barraclough, Lewis Brinson, Garrett Cooper, and Martin Prado are all currently on the disabled list. Barraclough is eligible to be activated today, and there’s a chance that he might be back for this series. The other three aren’t expected to be back for at least another few days. Miguel Rojas is banged-up, too, but he’s listed as day-to-day.
? I’m still angry about it. There’s nothing justifiable about Urena’s actions, and Major League Baseball needs to reevaluate how it handles head (or elbow) hunting. But I digress. Isaac Galloway (166 OPS+ in 27 PA) might see a start in center, and Miguel Rojas (87 OPS+) will start at short if he’s healthy. Lopez has rocketed through the Marlins organization since being acquired from the Mariners last summer, finishing 2017 at High-A and reaching the majors on June 30, 2018. He made a good first impression, too, holding the Mets to two runs in six innings, striking out five, and keeping the ball on the ground (55.6% grounders). 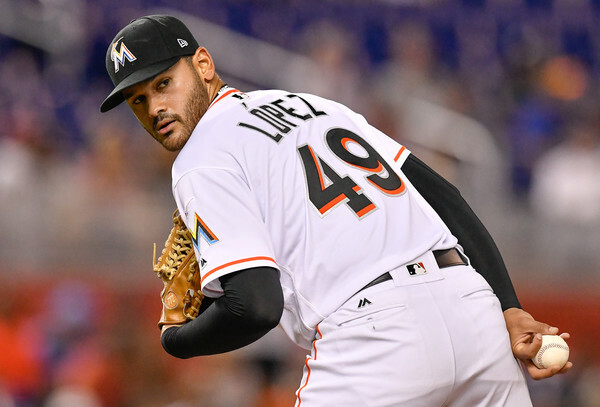 Lopez has had his ups and downs since then, which isn’t too shocking considering that he’s a 22-year-old that made a total of a dozen starts between Double-A and Triple-A – but the potential’s there for a decent mid-rotation starter. Lopez is a four-pitch guy, working with a low-90s four-seamer, a low-90s sinker, a mid-80s change-up, and a high-70s curve. He has a 52.1% groundball rate on the season, and a strong 6.2% walk rate, to boot. Richards is also a rookie, having made his debut back on April 2. He spent the month of May back in Triple-A, making six starts, but he’s been with the team the rest of the way. 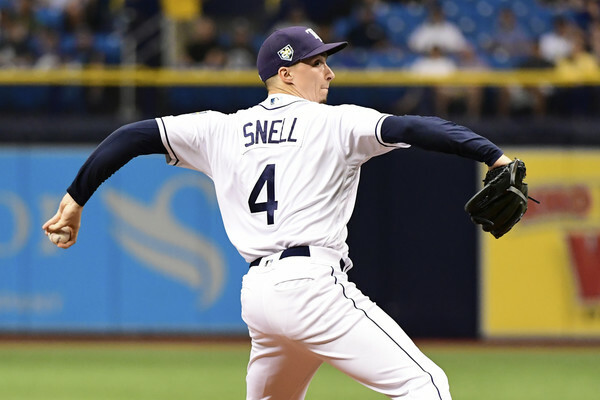 He has an average-ish 4.28 ERA (3.97 FIP) in 90.1 IP to go along with average strikeout rates (22.4%), but he walks a lot of batters (10.2%) and gives up a lot of flyballs (36.2% groundball rate). The 25-year-old Richards is a three-pitch guy, working with a low-90s four-seamer, a low-80s change-up, and a low-80s curve. His change-up is his out pitch, boasting a strong 41% whiffs per swing rate. Kyle Barraclough had been the closer, and he racks up strikeouts (25.0%) and walks (13.9%), en route to a 3.75 ERA. 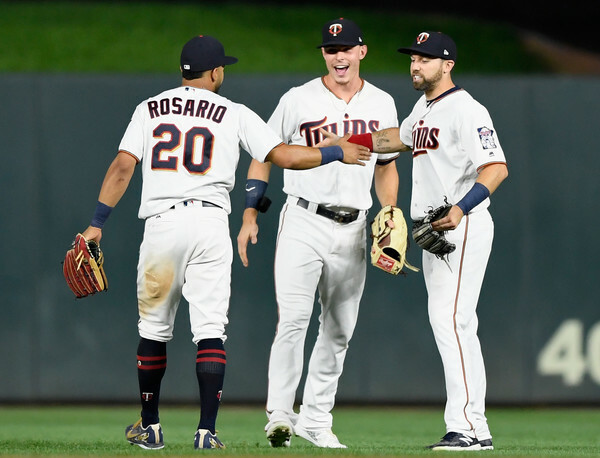 Their most reliable reliever otherwise is Drew Steckenrider (3.40 ERA, 27.6% strikeouts in 53.0 IP), with Nick Wittgren (3.63 ERA in 22.1 IP) and Drew Rucinski (3.74 ERA in 21.2 IP) being serviceable in limited duty. Realmuto has emerged as the best catcher in baseball, with superb offense coupled with strong defense behind the dish. He’s a legitimate star. 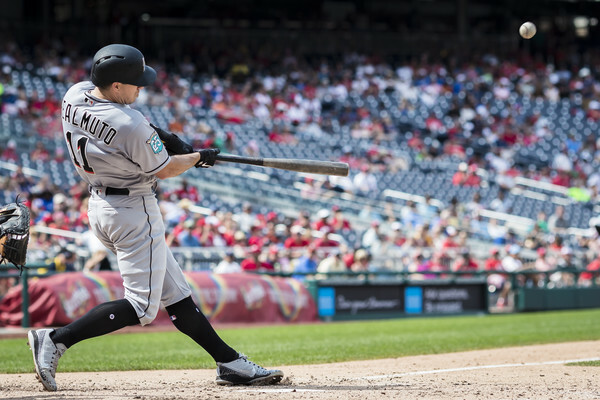 The Marlins are otherwise a team of journeyman and rookies, and none of those rookies have been terribly exciting so far. As such, I’ll be watching (and hoping) for the Yankees to keep rolling over subpar teams.